The median pay shown for each job title reflects the typical total cash compensation for that position across all locations and industries. Total cash compensation includes base annual salary or hourly wage, bonuses, profit sharing, tips, commissions, and other forms of cash earnings, as applicable. 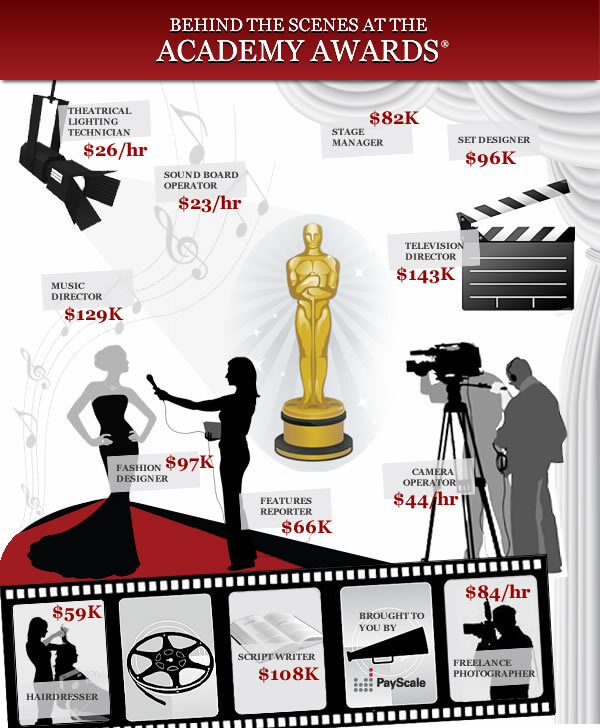 It stands to reason that those who secure a job behind the scenes at the Academy Awards will be paid on the higher end of the pay distribution. For this reason, we also include the 90th percentile pay as an approximate measure of top earners in the field. Levels of experience vary depending on the job requirements for each position. The typical level of education of people in these job positions is also listed. Academy Awards® and Oscars® are registered trademarks of The Academy of Motion Picture Arts and Sciences. Who makes sure that the red carpet arrives on time and the sealed envelope is in the right presenter's hand? For each million-dollar smile we see on TV during the Oscars®, there are dozens of talented people behind the scenes working to pull the whole event together. What do they earn?